How much should my AdWords budget be? This is a very common and an important question for advertisers. It is also one that doesn’t have a straightforward answer. If AdWords is profitable for you, then by all means your budget should be as high as possible. If AdWords is not profitable for you, then your budget should be ZERO.For most advertisers, the real answer lies somewhere in between. Some products and services can be profitable for you to advertise, while others may not be. Some keywords, geographic locations, mobile vs traditional platforms, and other targeting options will drive Adwords profitability. 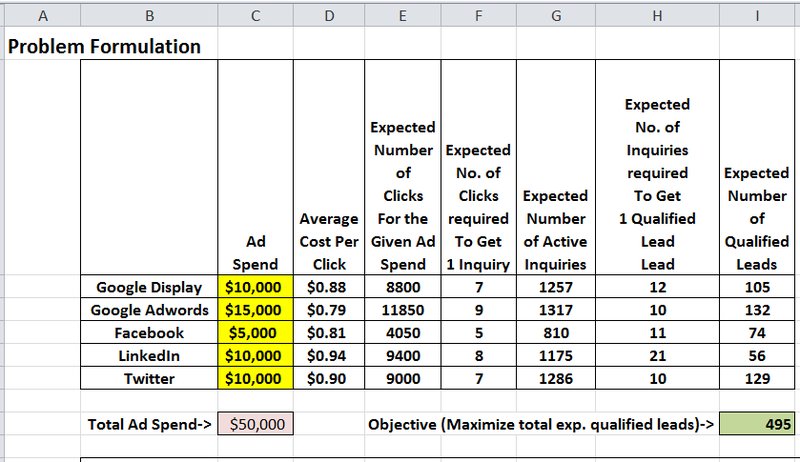 Adword Budget Optimizer example spreadsheet will assist you allocate advertising dollars efficiently among various pay-per-click advertising vehicles. If you expect AdWords to make profit for you from get go, you are setting yourself up for unpleasant surprises. There is often an initial investment required until you can figure what is working and what isn’t. An advertiser wants to allocate a pay-per-click marketing budget among five internet marketing vehicles – Google Display, Google Adwords, Facebook, LinkedIn and Twitter. Every single one of the pay-per-click vehicles has a different pricing and effectiveness per click. The objective is to achieve the highest number of qualified leads by dividing the advertising budget optimally among these 5 pay-per-click vehicles. The advertiser is constrained by budget limits and each pay-per-click vehicle has an advertising spending limit as well. These variables have been used in this example to simplify the optimizer. The lead conversion numbers can be indexed to something realistic. Refer to MarketingSherpa’s 2012 PPC Edition chart of their Search Marketing Benchmark Reports and the conversion rates by industry. The objective of the problem is to achieve the highest number of qualified leads by allocating the ad budget optimally among these 5 pay-per-click vehicles. The main task is to maximize the total number of qualified leads. Number of qualified leads depend on Ad Spend$ (column C), Average Cost per Click (Column D), Expected Clicks Required to get 1 inquiry (Column F), Expected number of Active Inquiries (Column G), Expected Inquiries required to get 1 Qualified Lead (Column H). Integer constraints ensure that Ad Spend are kept in whole dollar amounts. 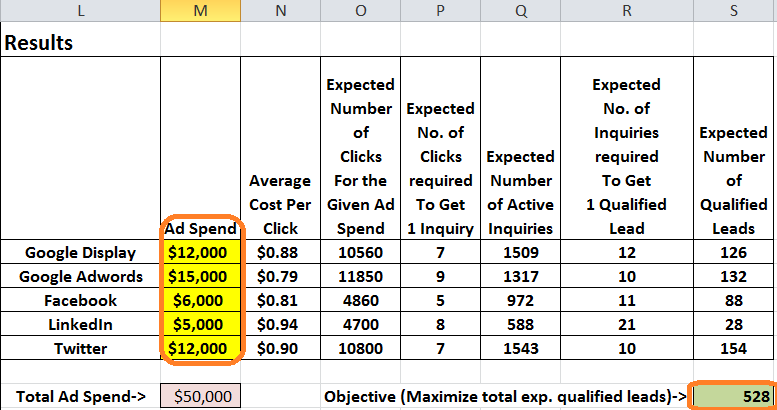 The objective cell is S9 which is maximization of “total expected number of qualified leads”. Since the objective function is linear first order, Simplex LP is the chosen solving method. Note: You must have Excel Solver installed before you do this exercise. 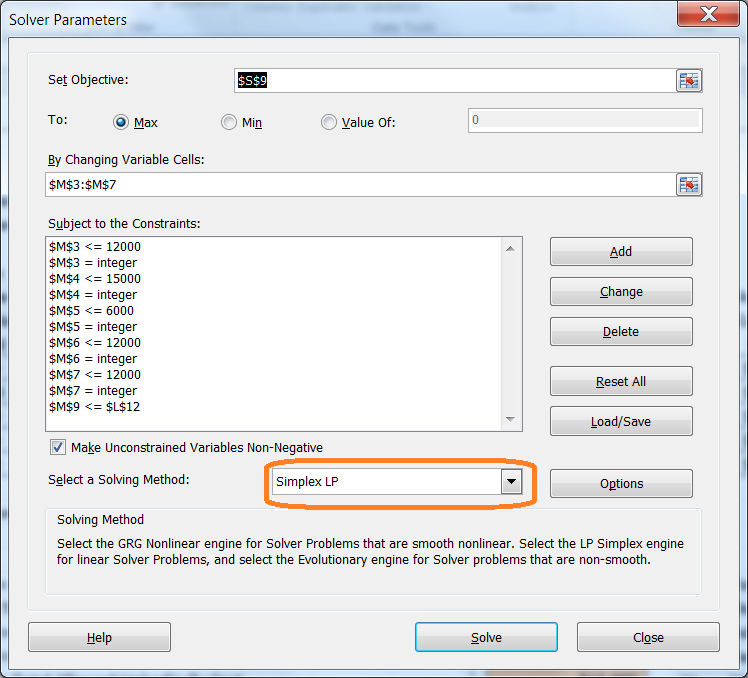 In Excel 2010, Solver can be found under Data menu. If you are unsure about it, the installation steps can be found here. Solver has finished its job and has optimized Ad Spend allocation among 5 pay-per-click vehicles (Column M3 through M7). The amounts are highlighted in yellow. As you can see, LinkedIn constraint did not hit the target limit and $7000 slack is available. After running this optimization model, the objective function value (expected number of qualified leads) improved from original 495 to 528, which remained our objective.